So, this was my first day of the iconcourse here in Larissa, Greece. What an amazing day! I chose Theodore for my teacher because he paints the most wonderful icons (of course). What is special about his icons is that the colours blend into each other so wonderfully, so smoothly. 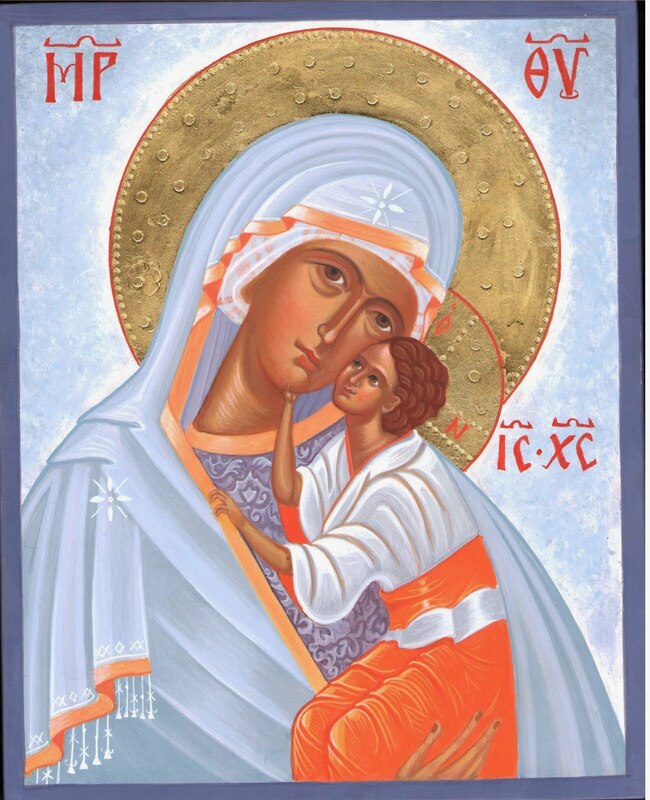 I was trying to paint like that today, on a small part of an icon, the arm/sleeve of the Christ holding the book. Theodore had drawn the paart I was to paint, I put the bottom layer on, like he did. Then, I painted the dark lines for the folds, and not just a line, it maaystart small and then ends wide... and also put this colour on the outlines of the arm. Actually, he makes 8 different tones before he starts to paint at all. Firstly the colour of the first layer, and then 4 lightenings. And also 4 shadow colours, The darkest colour of the shadow, and 3 lighter tones. My result today was not too bad for a beginner, but I can easily see where I need to improve. The lines, the lines, my teacher says.. Trying to start for instance a lightening broadly and end in nothing!! Have to work on that. Think I am reasonably good at it when my painting is lying down, but with it upright, and with my arm dangling in the air... it is quite another thing! Good I am here to learn...I that I have the best teacher ever! In between the painting we also got time to talk a little. It took us less than 5 minutes before I realized it was as if he was reading from A Course in Miracles. I was almost blown down from my chair. Amazing, meeting a complete stranger in a far away country, who seems to have excactly the same thoughts and understanding as I have. In truth - no encounter is by incident. I am so happy to be here in Larissa, which by the way is the hottest city in Greece. I am not good at heat... usually. But this time I have decided it will not bother me. 37 degrees today..and I am still OK! What a wonderful experience. As you say, no encounter is by accident.